The delivery of the Manitowoc 4600 was delayed considerably. Nevertheless, in order for the work to begin, the excavation material around the building site was provided with a dike, which was controlled day and night and repaired as appropriate with a wheel loader Caterpillar 988. Of course the dike broke especially through storm and high waves, but was repaired again quickly. 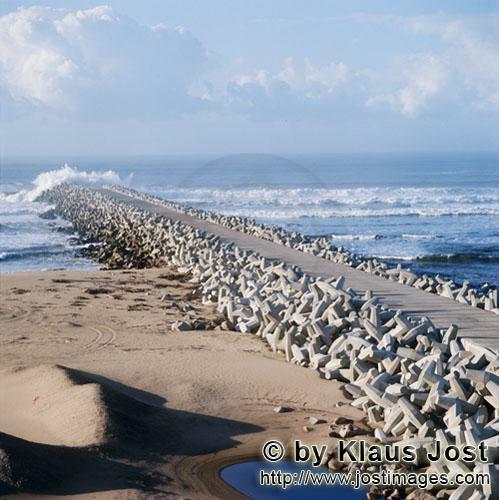 Therefore the north breakwater could be started in an ideal way. However, as the breakwater penetrated even further into the sea, this method was no longer possible. Luckily, exactly at this point the Manitowoc 4600 arrived on the site. On the concrete head of the breakwater, 8.0 m wide and 2.40 m thick out of unreinforced concrete, the crane was able to drive to the far end on the sea side and begin its work. The dolosse were laid in such a way that the Manitowoc 4600 could move freely.